2014 Sym e-Virid. Picture credits - Sym. Submit more pictures. E-Virid is a brand-new e-vehicle introduced by SYM. 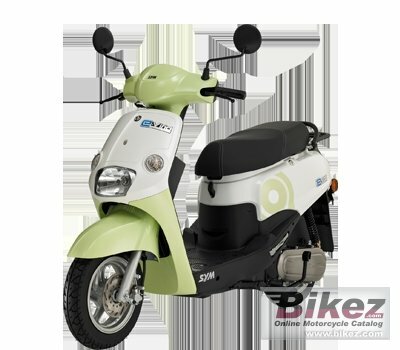 E-Virid owns an appearance of scooter with delicate design, while offering eco-friendly and satisfying trip to users at the same time. Comments: 2,5 hours charging. Range 50 km. Lithium ion battery, 48 V 20 Ah. Called E-Woo also. Ask questions Join the 14 Sym e-Virid discussion group or the general Sym discussion group.